I would recommend studying at NTU to anyone, because it’s difficult to find a university with a good reputation and a wide variety of facilities that also offers you creative freedom. "I chose NTU mainly because of its facilities and good reputation. I haven’t seen many universities with such a wide variety of workshops, studios, theatres, and even a gallery! Another reason was the freedom that you get on the course. Also, the educational system allows me to be free to develop myself as I choose, not as I’m told." Can you tell us more about your involvement with Collabor-8 Collective at Nottingham Contemporary? “The studios are very big, and we get the chance to pick a place according to our needs. We also interact with other people from our year, and it’s possible to move around and interact with students from other years and courses. The workshops have a huge variety of tools, and I think that they are comfortable and very intuitive. The technicians are always around and there’s always a chance to have a chat and ask what we need to know. “We are lucky to have a gallery on campus, so we can spend lots of time analysing each piece within each exhibition if we want to. I really like the fact that we have a shop inside the Bonington building as I can buy whatever I want there. They have a wide variety of art supplies, from paints to lino sheets. 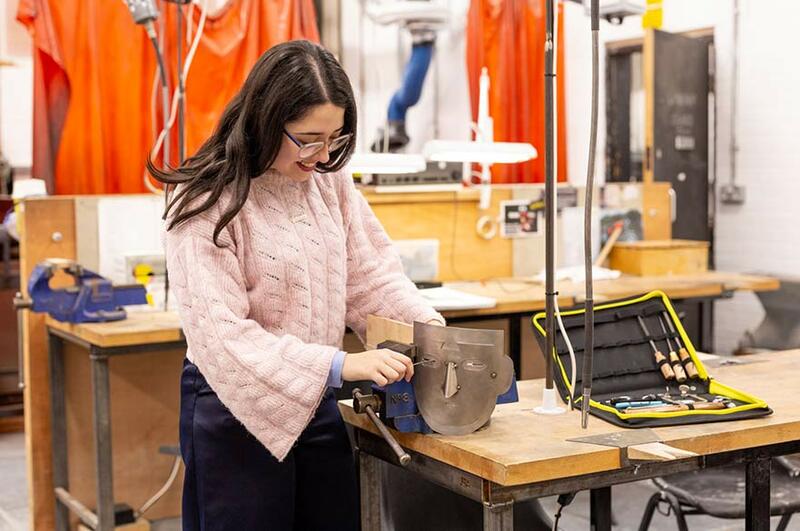 In a nutshell, why would you recommend your course / NTU to someone looking to study BA (Hons) Decorative Arts?